Best husband of the year award goes to Phillip! After having his wife show him images from my website and Facebook page, oohing and aahing over them, he made the excellent decision to sneak away their pup for a photo session as a surprise birthday present for her. He gave me free reign to capture the sweet and fun loving nature of their boy Barkly; check out this handsome duo! Because Phillip had already decided that he wanted something for his wife's desktop, I suggested an Album Block (which can be seen on the Shop page of this site) so she could have 10 images to rotate through as she wished. He agreed, and that opened the door to really do some creative things so there would be a variety of images for her to choose from on any given day. Phillip was constantly stroking Barkly during the session, so I thought some intimate images, showing that bond, as well as his wedding band, would be something that his wife would connect with and love (the report back on that was a resounding "yes"!). The feet image was quickly captured on a break when I looked down, saw that and thought, "gotta get that!". I like to keep things light and fun during a session; yes, we'll capture some posed images, but after a few minutes everyone's ready to break loose and that's when the magic happens! Barkly was a clown and kept sticking his nose into the camera, so we rolled with that! Mission accomplished; Elizabeth was surprised and loved all the images and the Album Block. She regularly shifts from one image to the next depending on her, or Barkly's mood that day! If you've got someone special in your life that you'd like to surprise, contact me and let's scheme together to create a personalized session and artwork that will be cherished forever! Tracy Allard of Penny Whistle Photography is a Certified Professional Photographer with the organization Professional Photographers of America; a designation held by fewer than 2,500 photographers nationwide and a hallmark of consistency, technical skill, artistry and professionalism. 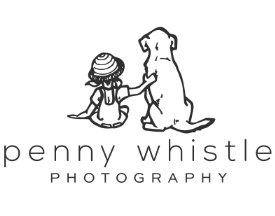 Penny Whistle specializes in both natural light and studio photography providing family and pet portraits as well as corporate headshots and commercial photography in her studio located in old town Carrollton as well as out on location in Coppell and surrounding communities in Dallas – Fort Worth, Texas. The nose image is my absolute favorite! You do such beautiful work. - The nose image is my absolute favorite! You do such beautiful work.